A minimal coloring of a polyhedron is a coloring of its faces so that no two faces meeting along an edge have the same color, and the number of colors used is minimal. 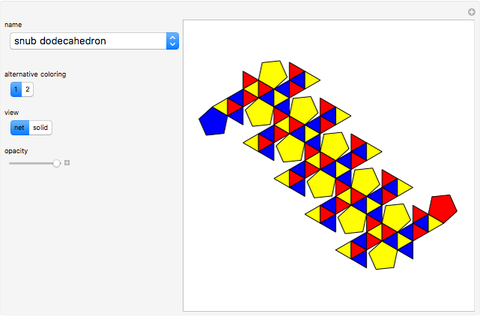 This Demonstration shows minimal colorings of the 13 Archimedean solids that you can view either in 3D or as a 2D net. Some of the three- or four-colored solids have more than one minimal coloring. Two examples are given in those cases. Theodore S. Erickson "Minimal Colorings of Archimedean Solids"